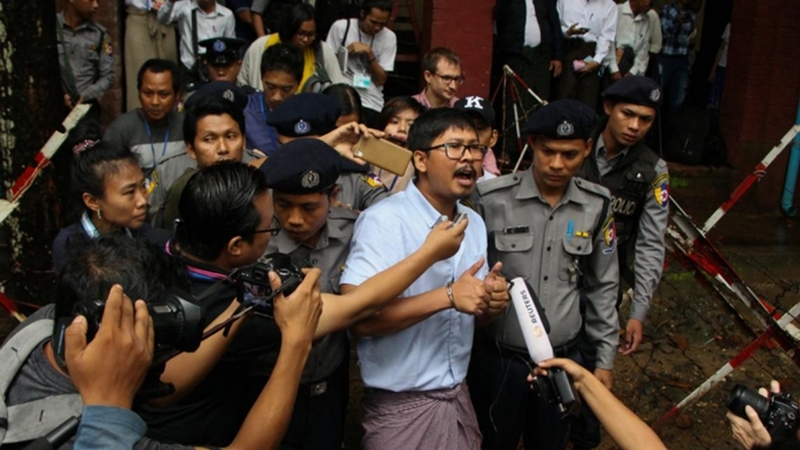 MYANMAR: Two Reuters journalists in Myanmar were hooded and deprived of sleep after they were arrested while investigating a massacre of Rohingya Muslims, one of them told a court yesterday (July 17) in startling testimony. “The police took us to a place but they covered our heads with masks,” he said, adding that he later realised it was a building notorious for torturing suspects. “They asked us questions every two hours and we did not have a chance to sleep for three days,” he continued. “They told us that we should not write it as the people who were killed were Kalar,” Wa Lone said, referring to a pejorative term for Muslims and South Asians in Myanmar. He said one of the policemen who stopped them outside the restaurant yelled out, “Here are secret documents – arrest them!” before the police had even looked at them closely. “It is like they already knew,” Wa Lone told the court. Civilian leader Aung San Suu Kyi’s reputation, already tarnished by her failure to stand up for the Rohingya, has taken a further hit with the widely decried prosecution of the Reuters pair.